The new pay on exit parking system is due to go live in seven Taunton car parks this autumn. The council is working with contractors to complete the installation of equipment at the Orchard, High Street, Tangier, Canon Street, Wood Street, Castle Street and Enfield car parks. The complex work which has included ground works, installation of barriers, machines and cabling, is due to finish by end of this month. A period of testing and training will then take place with the aim of going live in early November. This means customers will be able to take advantage of the new arrangements in the busy Christmas period. The Council has already installed Variable Message Signing (VMS) at key locations such as Priorswood Road, Cross Keys, Toneway, East Reach, Silk Mills and Wellington Road. The VMS systems will help drivers to find car parks and know how many spaces are available and the type of parking – short stay, long stay and commuter. It will also avoid them having to drive around to find a suitable space and should ease queuing and reduce congestion. 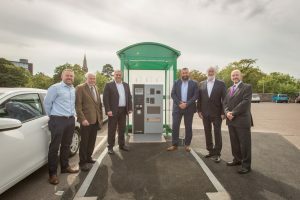 A new charging regime to help with clearer pricing and designation of TDBC car parks will also come into effect with the pay on exit scheme. Changes to the designations of the car parks will give users a clear understanding of where parking is available and for how long you can stay there. There are small increases for some car parks. Other car parks will remain static in their charging for short stays, while for longer stays in the majority of car parks, it will be cheaper for most people.